Canton's diddy DM5 soundbar has smaller rooms in mind | What Hi-Fi? Canton DM5 achieves compact dimensions "without compromising on performance, features or build quality". Generally, we’ve been bigger fans of Canton’s soundbases (such as the DM 55, DM 75 and DM100) than its soundbars. The brand’s new DM5 soundbar will no doubt look to level that balance, however. Aiming to pack the performance of its other models into a smaller box, Canton has made the 120-watt DM5 just 55cm-wide and 3kg heavy. Quite frankly, we’ve seen bigger Toblerones at Duty Free. Its size should hopefully make the DM5 easier to house, whether that is on the wall or positioned it in front of or below your TV. Three EQ switches are designed to optimize performance according to its placement in your room. Other sound modes include ‘voice’ for boosting dialogue; ‘hotel’ for limiting maximum volume; and the ‘eco’ power saving mode. Whether it’ll have the performance to oust the Award-winning Yamaha YAS-207 is unknown, but the DM5 looks generous on the features front. 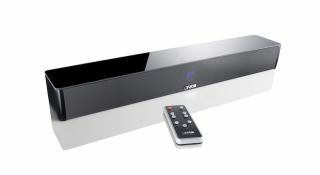 It’s well connected for a soundbar at this price, with aptX Bluetooth alongside optical, coaxial and analogue inputs. The DM5 is available in black or silver, priced £299.